If the trees in your yard have been established for a few years, you may think that they don’t need any special winter tree care. After all, you don’t see anyone giving trees in the forest any special treatment during the winter, and they survive just fine, right? Well, believe it or not, the trees in the forest and the trees in your yard must endure very different circumstances. For example, in a forest trees grow closely together. When it snows or when winds gust, no single tree takes all of the weight or all of the force. The tallest trees’ upper limbs form a canopy and will share the majority of the weight of the snow, protecting younger, smaller trees below. And with all of the trees so close together, you’ll notice that they don’t get blown so hard by the wind. The trees in your yard don’t have this protection or reinforcement, and they need your help to survive the winter and remain healthy. After a snowfall or storm, take a look outside. Are your trees’ limbs sagging? Are younger trees bending over at the trunk and looking like they’re weighed down by the snow? Ensuring that your trees don’t lose branches and don’t fall or get significantly damaged is as easy as a little bit of sweeping. Using a broom and being careful of weakened branches that may snap, go out to your yard and knock as much of the excess snow off of your trees as possible. If the broom isn’t long enough, you can use a long dowel rod or pole to get the snow off of the upper branches. Unbroken trunks and branches should bounce back to their normal positions. If you maintain your trees this way throughout the winter, you’ll see that they’re much healthier in the spring and summer. Here’s another difference between trees in the forest and trees in your yard. In the forest, because leaves are allowed to decay where they fall, the topsoil tends to be richer, deeper, and more nutrient-dense than the soil in your yard. Deep, rich topsoil will encourage your trees’ roots to grow down and out, creating more firm and resilient bases to help them stand up to harsh winter winds. You don’t have to uproot your lawn or bring in a full new layer of topsoil to give your trees the same benefits as those in the forest. In fact, all you need to do is add some mulch. Layer two to three inches of mulch over the root systems of each of your trees, and they’ll get the nutrients they need to grow strong deep into the ground and far out around the base. This is kind of a tricky one. 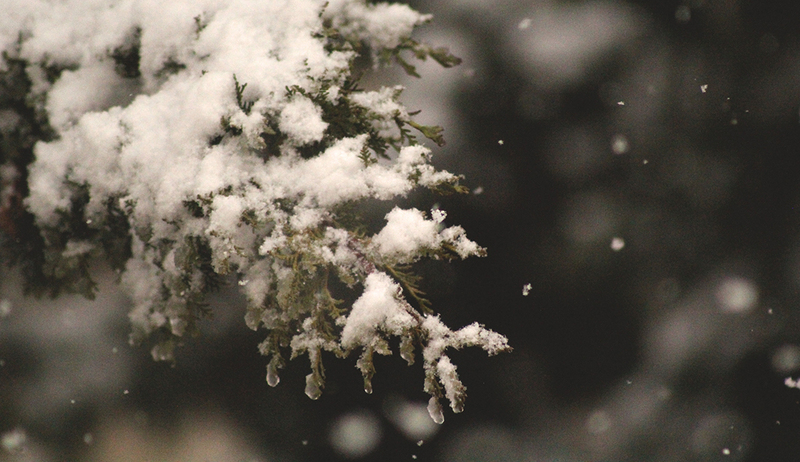 If you’ve had a lot of snow and/or rain throughout the winter, you may not have to worry about giving your trees a drink. However, if you’ve had a dry winter, though they may be dormant, your trees are going to be feeling some thirst. Do not water your trees if the temperature is below freezing and the ground is frozen. This will only create a layer of ice over the root system and won’t allow the roots to get the oxygen they need. When the temperature does rise above freezing, though, go outside and check the soil around your trees. If it’s dry, get the hose out and water them. Finally, especially if the weather isn’t warm enough to water your trees, avoid using salt to melt the ice on your driveway and front walk. If it gets to the base of your trees, salt will dehydrate your soil and leave your trees parched. Now you should have the facts to help you care for your trees this winter and see them grow strong and healthy this spring and summer. Enjoy!